Oats are cereal grains. 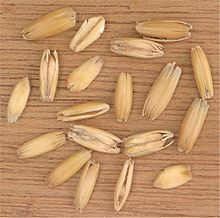 Oats are unsuitable to make bread by themselves, but are often added to baked goods as oat flour or rolled oats (crushed flat between hot rollers). Consumption of oat bran has been linked to a reduction in LDL cholesterol, and possibly a reduced risk of heart disease. In theory, oats may be safe to eat in a gluten-free diet. However, in practice, oats are often cross-contaminated with wheat or barley either growing in the field alongside oats or in the transportation and processing systems that are used in common. Additionally, studies have shown that some people with coeliac disease are also sensitive to oats, even when any risk of cross-contamination has been eliminated. This page was last edited on 5 April 2010, at 10:20.